Let’s hear it for 2009. 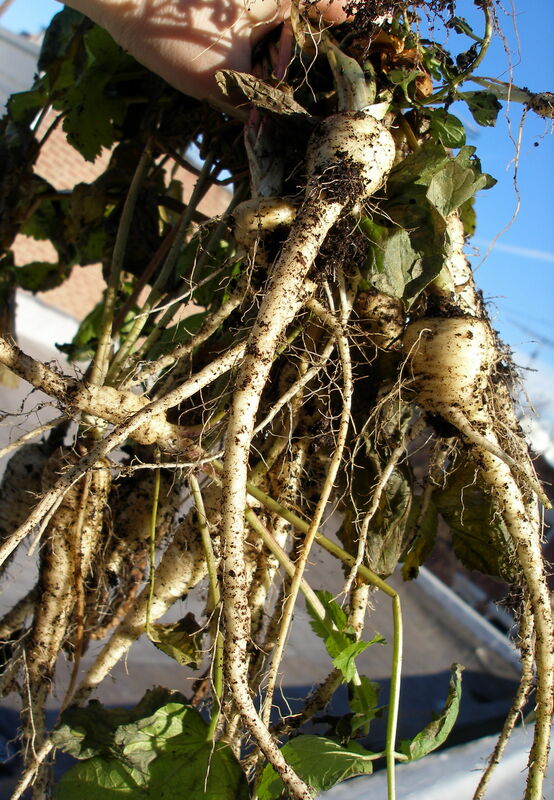 Exactly 135 days after these javelin parsnips (a hybrid known for its slender root, hardiness, and resistance to canker) were planted, they were harvested. Sure, just a couple of days ago POD was pretty certain they’d kicked it. After all, it seemed as though it rained almost non-stop between mid-August and late-December, this was one of the chillier Philly falls in recent memory, temperatures well below freezing and last week’s two feet of snow couldn’t have helped matters, and by November/December, the little blue deck sees all of an hour of direct sunshine each day (when the sun shines). Disaster, right? But then it rained for two days, the soil thawed, and Sunday dawned bright and sunny. Rare and precious sunshine means puttering around outside. Outside means the little blue deck. While cleaning up, transporting pots into the basement, and basically closing up shop, I decided to dig into the parsnip pots. And guess what? Underneath the freeze-dried and dead, dead leaves were creamy white parsnips. All told, the perimeters of three five-gallon buckets produced just over a 1/2 pound of parsnips. Not bad for the first foray into parsnip planting. Definitely a do-again for next year. After all, what could be more satisfying than roasting up freshly picked vegetables in December? With the recent passing of the Winter Solstice (a sure sign of spring if ever there was one), POD can officially begin looking forward to brighter days. It certainly helps when Dan the Mailman drops of a big “thunking” pile of seed catalogs through the mail slot. This should help soothe the wind-chapped cheeks and dry-aged hands and help Plants on Deck forget (or at least ignore) the two feet of dirty snow melting away on the South Philly streets. And the Michigan-like chill that slaughtered any hopes of parsnips and Brussels sprouts. 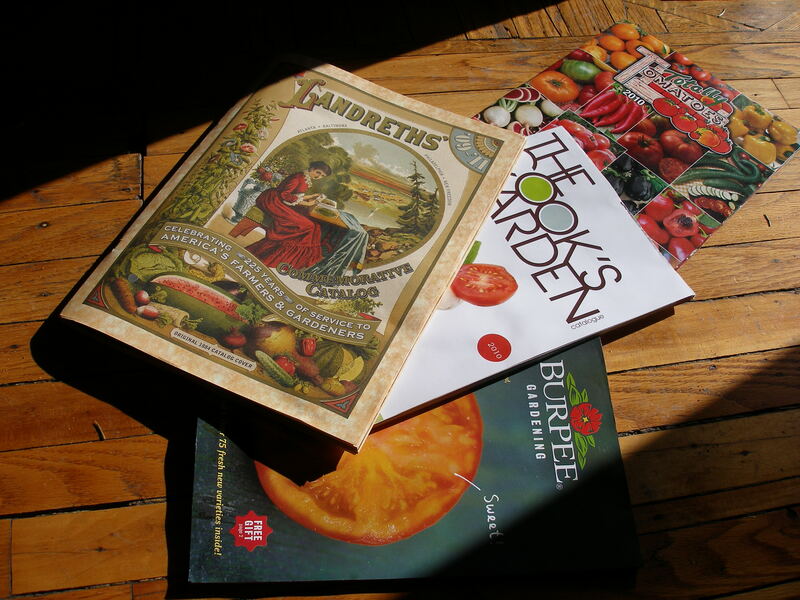 The past couple of winters have brought a slew of lovely cookbooks into the Plants on Deck house. (For a little pictorial tour, check this out: Yummy) One of the more recent additions to the sagging cookbook shelf is the delightful Momofuku, by David Chang and Peter Meehan. 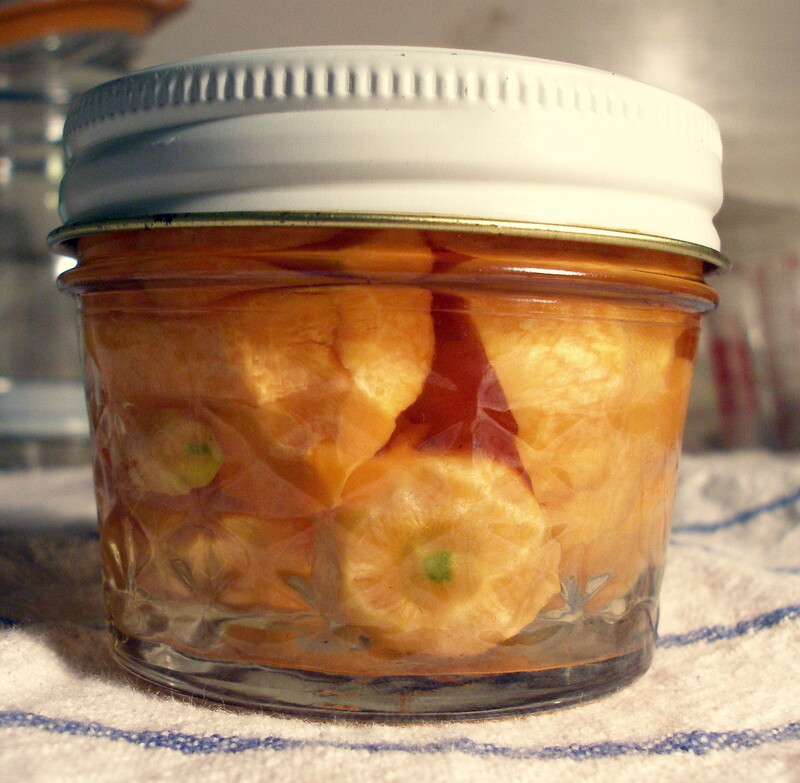 Chang’s super-simple pickling recipe arrived just days before Philly’s first hard frost and rescued POD’s carrots from certain death. Sadly, the parsnips and sprouts may not survive. Obviously, the brine is easy to scale back and a 1/4 recipe took care of the carrots. 2.) Pack the prepared vegetables into a quart container. Pour the brine over the vegetables cover, and refrigerate. You can eat the pickles immediately, but they will taste better after they’ve had time to sit 3-4 days at a minimum, a week for optimum flavor. Most of these pickles will keep for at least a month. 3) Two pounds baby carrots (as in infant or dwarf, not the whittled and bagged supermarket variety), scrubbed, peeled, and trimmed. If you can buy carrots with tops, leave ½ inch of the tops attached and clean them well; it makes for a better presentation. For larger but still small carrots, cut them lengthwise into halves or thirds – they should be a size that’s comfortable to pick up and snack on, through they don’t need to be bite-sized. Well, folks, POD 2009’s days are nearing the end. That is, we’re approaching the shortest day of the year and the bits salvaged from the little blue deck are precious and few. 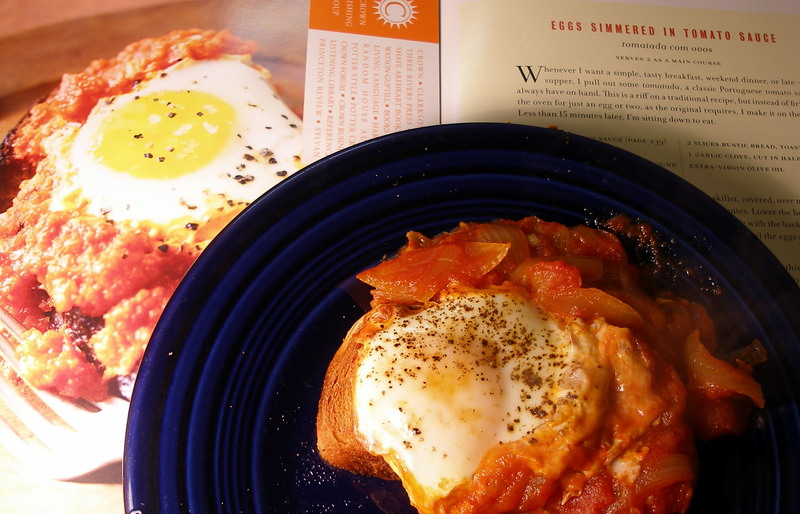 So, let’s hear it for David Leite’s Eggs Simmered in Tomato Sauce. 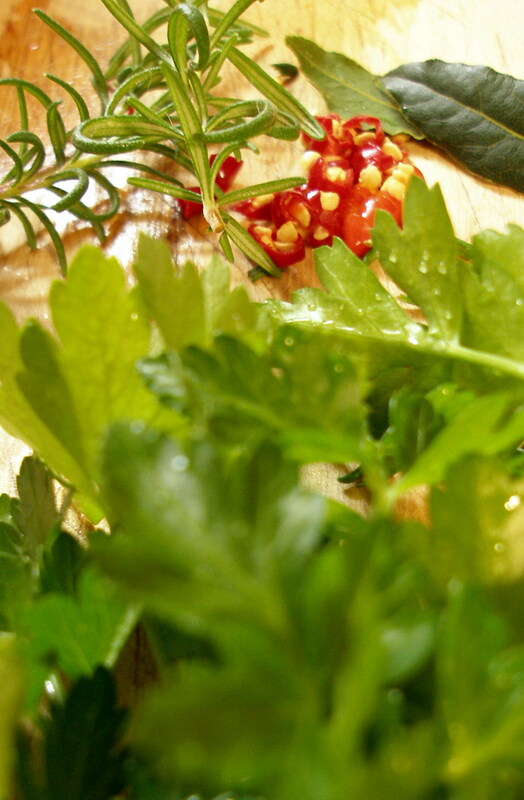 What a great excuse to snip what’s left of the parsley, Thai chilies, bay, and rosemary. Okay, so the bay and rosemary live a pampered indoor life these days, but still. Eggs Simmered in Tomato Sauce, tomatada com ovos — adapted ever so slightly (POD’s minimal revisions in parentheses) from The New Portuguese Table, by David Leite. 1) Warm the tomato sauce is a small nonstick skillet, covered, over medium-high heat, until it’s bubbly and (very) hot, about 5 minutes. Lower the heat to medium, stir, and then make two wells in the sauce with the back of a spoon. Crack an egg into each well and simmer, covered, until the eggs are cooked, 5 to 8 minutes. 1) Heat the oil in a large skillet over medium heat until it shimmers. Add the onions, parsley, and bay leaf and cook until nicely golden, about 15 minutes. Add the garlic and cook for 1 minute more. 2) Turn the heat to medium-low, stir in the tomatoes and their juices, the tomato paste, and chili pepper, if using, and bring to a simmer. Cook, lid ajar, stirring occasionally, until the tomatoes break down, about 30 minutes. 3) Toss out the parsley and bay leaf(ves and rosemary), and season the sauce to taste with salt and pepper (and honey). If you wish, you can scrape the sauce into a food processor and buzz until smooth (peshaw). Store the sauce in the fridge in a glass jar with a tight-fitting lid for up to 1 week; it can also be frozen for up to 2 months. As the first slush falls from Philadelphia’s seemingly ever-gray skies, it’s tough to think happy gardening thoughts. 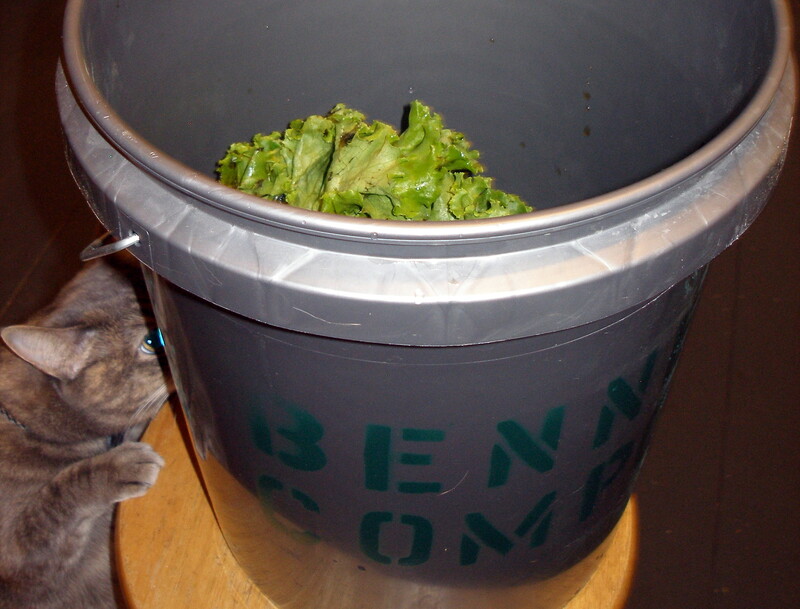 Happily, though, thanks to a tip from November’s Grid magazine, all of POD’s degradable kitchen scraps will find their way into a spiffy five-gallon bucket, courtesy of Bennett Compost. With any luck, a bucket or two of rich compost will find its way back to POD. 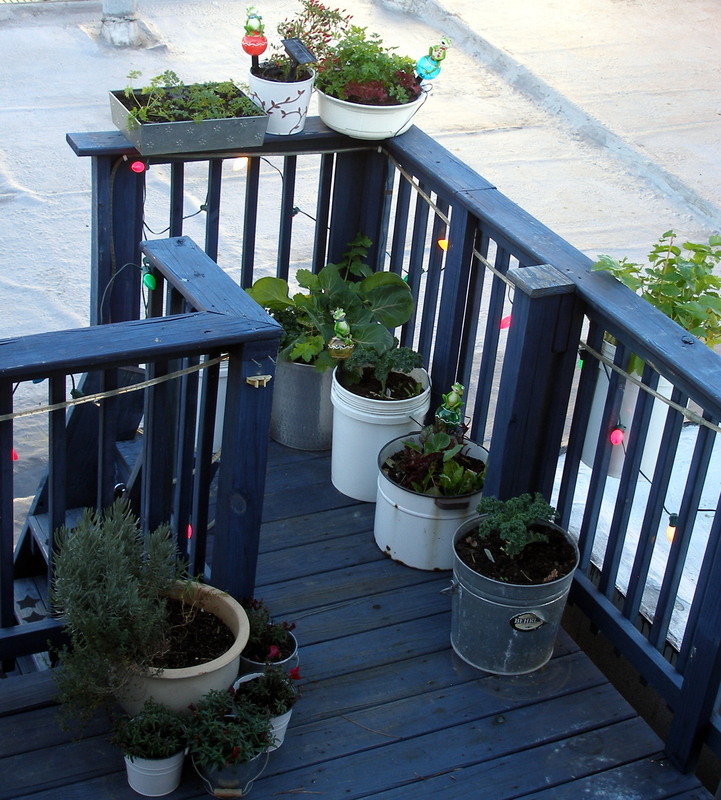 Although most of PODs veggies begin life as seeds crammed onto one of two sunny (cat-free) sills, occasionally a starter set or two makes its way onto the little blue deck. Unfortunately, the stupid big-box store kale infested my late radishes with ravenous inch worms (yeah, yeah, serves me right). So, next year a visit will be paid to Philly’s Greensgrow Farm. Not much to report these days. Despite the minuscule sun exposure, the kale greens on, the parsnips persevere, and the Brussels keep sprouting.